Rowan Storm is by Xaviera Medina de Albrand, the Peruvian founder of Mujeres Mundi, a social communication project aiming to raise awareness about the role and capacity of women in the development of a society. Rowan Storm is invited to serve as Creative Director for a project of the Craft and Folk Art Museum: Folk Wedding ~ Folk Art Everywhere. Rowan Storm is deeply honored to be featured as the first Moxy Woman of 2010 by the International Association of Moxy Women. Jean Harper, Moxy Women's CEO, interviews Rowan Storm for the Moxy Women website. John Schneider interviews Rowan Storm several months after her return from her first trip to Iran, and before her collaboration in concert with the Lian Ensemble at St Matthews Church, Pacific Palisades, 11 Jan 2007. 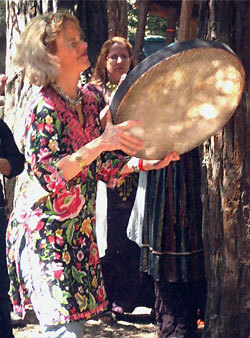 Rowan discusses her introduction to Persian music in the late 1960's, and some of her travel experiences to Kurdistan Iran, to play daf with the women dervishes.